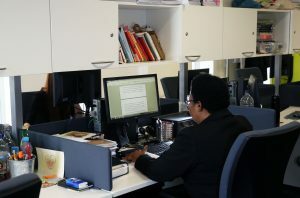 The month of April marked the beginning of a new cohort of postgraduate researchers (PGRs) taking up their desk allocations in our dedicated writing-up space, the Researchers’ Room. One of the Doctoral Academy’s most prized provisions, the Researchers’ Room is a collegial space in the city centre, housed alongside our seminar rooms and offices in Friary House. Our mission is to equip final year PGRs with a focused environment where they feel supported in tackling the concluding, and critical, stages of their research programmes. Each one of the 40 desks available is allocated on a six-monthly basis to a student who is close to submitting their thesis, with the possibility of extensions beyond that if required. The workspace is comprised of a networked computer, three lockable storage units, and access to kitchen and printing facilities. The idea behind the Researchers’ Room is that the more support we can give our final year students, the easier and more pleasant the final push towards the long-awaited completion will be. While applications for a desk allocation are welcome on a rolling basis, we run two yearly intakes of new users, in April and October. The new users are granted 24/7 access to the room, giving them the flexibility to create their own schedules for planning and writing their work, safe in the knowledge that there is a space reserved for them. The overwhelming feedback from current and past desk-holders is that, while some may not adjust to the hot-desking provisions available in many Schools, having a desk secured in the Researchers’ Room improves their work-life balance drastically, and gives them a chance to work shoulder-to-shoulder with similar minded colleagues facing the same challenges across all Colleges. Although studious silence is one of the most determining aspects of the space, the Researchers’ Room also boasts a good sense of community, bringing people together from across the University, strengthening relationships and building on the idea of belonging to a wider research community. This is part of our vision to nurture an environment where each student is actively encouraged to interact with researchers across the University and feels part of the PGR community at Cardiff University. 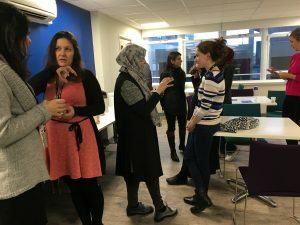 For Alexia, a writing-up PGR in the School of History, Archaeology and Religion, “the possibility of extending your connections beyond your home School and of sharing experiences with a wide range of different users is one of the big selling points of the space”. A regular in our social get-togethers for the Researchers’ Room, Alexia believes it “manages to provide an intensive writing and hard-working atmosphere with the added bonus of seamlessly creating a potential for networking and community-building, giving you that sense of being enmeshed in a PGR culture at the time you need it the most”. If you are interested in securing a desk space and being part of the welcoming Researchers’ Room community, fill in this short survey to apply. Feel free to drop us an email at doctoral-academy@cardiff.ac.uk anytime with questions or simply pop in for a tour of the premises – we will be more than happy to show you around!